Brilliant natural light abounds in this fresh reimagination of a modern kitchen whose bold patterns and comforting charm draw you into its warmth and glow. It is the details within this environment that truly give this kitchen its own graceful character. 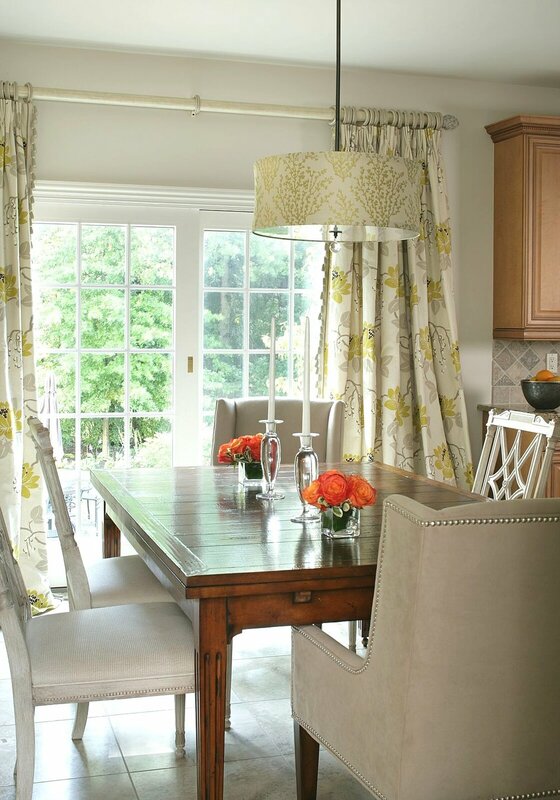 The patterned fabric of a small-scale drum chandelier coordinates beautifully with the custom drapery, while gorgeous wing chairs with silver nail heads serve perfectly for leisurely meals and snacks. Painted side chairs and a stunning, hand-planed dining table round out this distinguished modern kitchen, proving that modern can feel fresh, enlivening and elegant all at the same time.